ANAHEIM, Calif. — With the darkest days behind him, David Ortiz is having fun again. He was wearing some serious bling yesterday morning at the All-Star media session, including a pair of dark sunglasses that had red beads and diamonds that probably cost more than my house. “You have to be a rock star to wear these,’’ kidded the Red Sox designated hitter. Some believe you have to be a rockhead to participate in Home Run Derby, but Ortiz embraced it last night, and afterward he was embracing the trophy he won, sitting at his press conference with his son D’Angelo. Ortiz ignored the recent theory that participating in the exhibition messes up a player’s swing for an eternity. No stranger to messed-up swings, Ortiz defeated former teammate Hanley Ramirez, a player he has mentored, by stroking 11 homers in the last round after the two were tied with 21 homers through the first two rounds. Ortiz’s 32 homers averaged 417 feet and his longest was 478 feet, second to Matt Holliday’s 497-footer. Earlier this season Ortiz texted Ramirez after he was benched by former Marlins manager Fredi Gonzalez for not hustling after a ball in play. Ortiz told Ramirez to be accountable for his actions. Last night Ortiz wondered what might have been. Ortiz admitted he was exhausted after his victory, but in a good way. He dedicated the win to his friend Jose Lima, the former major league pitcher who died in May. Ortiz’s caring nature had the other players cheering for him. Torii Hunter predicted a Big Papi win. Ditto Adrian Beltre. Ubaldo Jimenez also thought the decision would go to Papi. But it was Milwaukee right fielder Corey Hart who got off to a hot start, blasting 13 homers in the first round. But Hart went homerless in the second round. 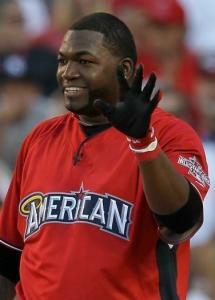 Ortiz actually was booed by the Southern California audience when he first stepped to the plate. His normal pitcher, Ino Guerrero, Boston’s batting practice pitcher, had returned to the Dominican Republic for the break, so he chose Yankees bench coach Tony Pena. Ortiz did OK in the first round, with eight balls leaving the yard, enough to advance. Leading off Round 2, Ortiz smoked 13 homers, including the 478-footer into the right-center bleachers. He faded toward the end of the round, but cranked it back up in the finals, winning the derby on his fourth try. Ortiz soaked in all the pre-derby activities, taking BP with his American League teammates. Ortiz is held in high esteem at these national events. If he’s not the most popular player in baseball among his peers, he’s probably in the top three. “Just a fun-loving guy. A big teddy bear, everybody loves Papi,’’ said Alex Rodriguez. “He’s such a good person. He’s somebody everyone looks up to for what he does on and off the field,’’ said Ramirez. When Ortiz was struggling, so many of his friends came to his defense, railing against those who said he was done. Good pals like Hunter kept telling people that Papi would rise again. Such support in the baseball community seemed to lift Ortiz to new levels before long. Not a day went by without a friend from some team texting him to keep his head up. Some of these players had every reason to hope the centerpiece of the Red Sox lineup had lost it, because it would mean their team would benefit. But nobody felt that way. So from that low point, all the way back to being a threat to be reckoned with again, Ortiz embraced the opportunity to put on a show for his friends and to help Major League Baseball promote a big name in this competition. Ortiz said he normally takes 200 swings a day between work in the cage, batting practice, games, and in between at-bats. He figures one takes 70 swings in Home Run Derby, though all of them are at full force. If anything, Ortiz was hoping this experience would help, not hinder, his swing for the fences. For any player, at any time, there’s nothing greater than the rush of hitting a home run. From Little League to the big leagues, it never gets old. For Ortiz, the rush of playing baseball again at a high level is the best feeling of all.